Rather, two volcanoes. This assumes that said bombs have been armored and shielded to survive getting thrown into magma (Pinatubo, shown below, is slightly easier to hit; Mayon, above, on the other hand, is harder). Stats are for an ordinary flat explosion, but who knows just what it takes to make a volcano blow up? Note to China: Hold off your bombs until you can make a volcano blow up from within with a shaped fusion bomb, such that the entire cone rises a few feet. And remember: always nuke from orbit with precision guiding, just to be sure. 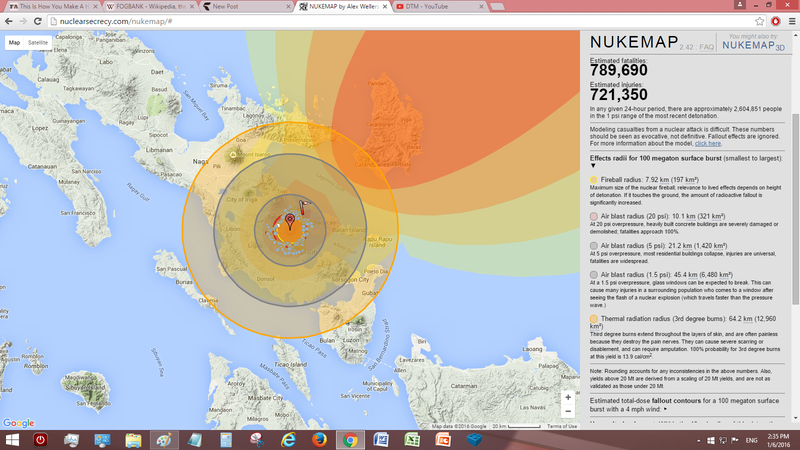 Here’s a 100Mt bomb that blows up in Manila, for comparison.